Sprawling crops like melons may need vertical support. 4’x 4’ and 4’x 8’ are ideal for backyard gardens. Longer is OK but widths larger than 4’ are difficult to access. Full sun with late afternoon shade is best. Don’t hide your garden – it can be a pretty part of the landscape. Near water source is important. Remove sod/weeds physically and toss in the compost pile. Newspaper or cardboard can be used to block grass and weeds from regrowing. Allow for walkways of shredded native tree trimmings. Many choices for edging or none at all. Add soil / amendments - Bed Prep: mix compost, rock minerals, sugar and organic fertilizer to native soil. Native tree trimmings or cedar is best. Do not use landscape fabric or plastic, pine bark, cypress, dyed or rubber mulch. 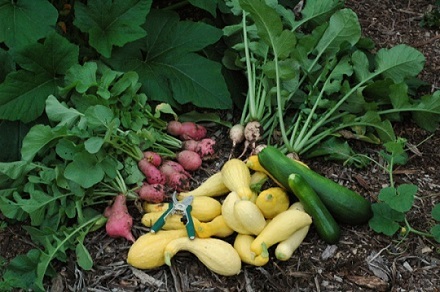 Refer to Texas Organic Vegetable Gardening book for reference and advice.